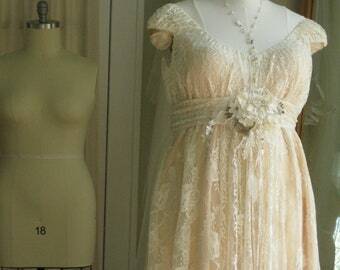 This will be a custom, made for you, a one of a kind gown, made from new, upcycled and vintage laces. The overall coloration in the photo's is ivory and champagne, it is a collage of several shades and can include, light ivory, creme, champagne, blush pink ... just let us know your preference. It can be any color(s) you want really. It is elaborately and lovingly appliqued at the hem and on the train. This gown pulls over the head and it super comfortable. It comes with a stretch ivory (or color of your choosing) slip. This is a true empire line design, but with a sash wrapped around and tied in front it can accent the waist a little more. It does not come with a sash. It will bustle for dancing or prancing. If you purchase one of our sashes we will hand sew it to the front of the gown so that it stays in place. Listing shows versions of this dress we have done that are all sold. This listing is for our peasant top version with a train. We have other choices for the top and it can be made without a train ($1,400). If you look through our previously sold dresses you can see more pictures of the versions of this dress that have been done. Sleeve options (as shown in some of the photos) are an additional $50 - $250, depending on design. Slip can be ombre dyed for $150. 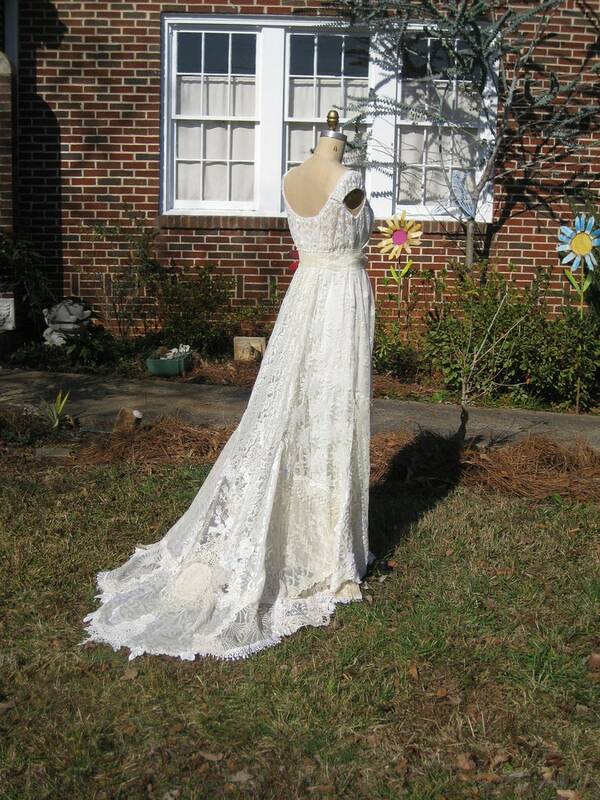 Added neckline decor as shown in some photo's is $25-$50. If you are interested in a custom version of this design we will get clear on details and pricing through convos and then do a reserved listing for a half deposit. Once deposit is received we send out main lace swatches for your approval on color palette and slip option swatches. Plus sizes (over 16) typically range from $1,700 - $1,950, depending on modifications and additions. In the U.S. this will ship Priority with tracking and signature confirmation. Insurance is extra is you want it. Shipping is $22.00. **Happy to quote shipping outside the U.S.